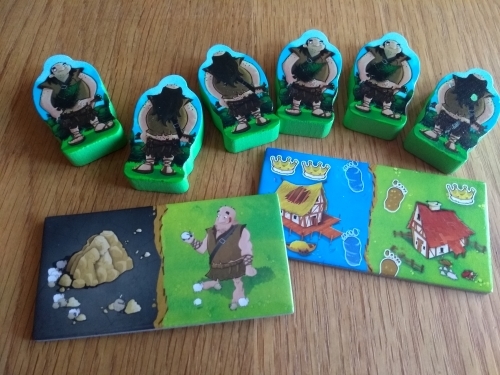 Kingdomino: Age of Giants* is the first standard expansion for Kingdomino, which was released in 2016 and reviewed by me in 2017 (you may also want to check out Queendomino – a standalone game that came out last year which is compatible with the original Kingdomino). As you have probably worked out from its title, the original game was loosely based on the old school dominoes concept: players take tiles made up of two squares, which traditionally have a different number (or here, pictures) on each end. In Kingdomino each player matches these in their own 5×5 grid to form matching areas and score points. 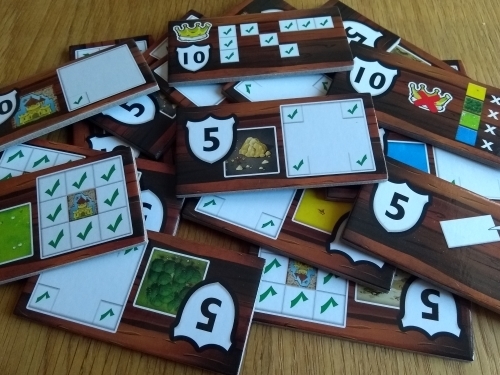 What made the original Kingdomino the 2017 Spiel de Jahres (German Game of the Year) winner is how it blends this simplicity with a clever but accessible scoring system, alongside a simple tactical turn order mechanism. The better the tile you go for each round, the later in turn order you’ll get to choose next time – with the added twist that you won’t know the range of choices you’ll get next turn until the order for the turn has been established. I feel I need to say something up front: this review is long, rambling, and may seem inconclusive and contradictory. So I’ll say here and now: I like it and I’m keeping it. It’s a troublesome child, for sure, but I love it all the same. What does Age of Giants bring to the party? This expansion consists of several constituent parts. The simplest to describe is the set of 17 ‘quest’ tiles. If you’re familiar with the base game, these build on the additional rules ‘The Middle Kingdom’ and ‘Harmony’: instead of these, you randomly draw two tiles each game to see how to get bonus points. These range from an exact copy The Middle Kingdom (plus a version where your castle needs to be in a corner), through rewarding certain terrain types being in certain places (corners, or adjacent to your castle), to scoring points for discarded tiles or large areas without crowns. Next is a score pad (hurrah!) and the pieces required to add a fifth player. The score pad is great (incorporating five players, plus spaces to score bonus points), but the fifth player pieces are a sad brown colour and disappointingly the base tile is the same as those in Queen (mosaic), rather than Kingdomino (plain). It’s a small point, and maybe later versions of Kingdomino have changed the original base, but it still irked me. The quest tiles are an enjoyable addition. You can choose them randomly or pick your favourites – either way, they add a simple extra strategic layer to an already great game. No complaints, but you could write them on paper: they don’t need to be fancy looking tiles. The score pad is great but is again fluff – we managed perfectly well before with a pen and paper. The fifth player components and tile tower are only usable/required when you play with the giants expansion. So, will you want to? Six of the tiles are lettered (A-F – the giants), six numbered (49-54 – the footprints). The lettered tiles have no crowns and a picture of a giant on them. When you take one, you add it as usual – and then take a giant meeple. This must be placed on one of your scoring crowns (your choice) – and if it’s still there at the end of the game, it won’t count. The footprint tiles have three crowns each and (you guessed it), big giant footprints. When you take one of these you again place the tile as normal, but you can also move one of your giants to another player’s kingdom (they choose which crown to cover). If you don’t have a giant, nothing happens. Is Kingdomino: Age of Giants essential? If you still enjoy the base game, and tend to have two to four players, absolutely not. You won’t need the fifth player pieces, while the other components make small changes to a game you’re currently happy with. Sit back, enjoy the game, then come back if it starts to feel a little tired. Conversely, if you like the idea of a fifth player, some extra scoring chances and a little change to the base game – come on down! But be warned: with giants, the game becomes quite a bit more random – and the less players you have, the worse that becomes. The base game had a handy list of all the tiles, so you knew what would become available: you could grock what was left, what chance you might get to score later etc. Sure, you can make a list of the new tiles and make your own sheet (I bet someone is squirrelled away making one right now to add to Board Game Geek) – but a slight change in the rules spoils that with anything other than five players. At lower player counts, you use all the dominoes – but you first lay out five, then remove either one of two before players choose which to claim (the middle value tile of the five with two/four players, or the second and fourth with three players). This means you never know what will truly be available in a game unless you have the full five players. I presume this has been done to ensure most of the new giant tiles are active each game, but it makes the game much swingier. As do the giant tiles themselves. We’ve all taken poor tiles in the hope of getting a good first pick next time – and been faced with junk. Sure it was annoying, but not huge – now it can be huge. In my last two-player game, luck of the draw saw me end up with no giants while Sarah got five. It wasn’t good play by me – it just happened that on turns I had little to no control, there were no giant tiles. I won by 60 points. That said, it would be easy to house rule that – as in the original three-player game – you instead each choose a tile and the ones not taken are discarded. But if there was a giant tile, the last players/players had to take them. Not very elegant, but at least all the tiles would have been in play. But you know what? I still like the giants expansion. I won’t play with it every time, but having the game able to go to five is great; the score pad is nice; the quest tiles are cool; and it’s nice to have a more chaotic, take-that version of one of my go-to family games. Sure, it has its faults – bot overall, I’m taken by it. Just know it can be super random, know your audience, and put it in front of the right players. Is Kingdomino: Age of Giants value for money? This is hard to call. Right now Amazon has the expansion costing more than the original game, which seems ridiculous. But then the base game is so unbelievably cheap at well under £20 – maybe its that which is under-priced? Anyway, for around £20 the expansion has enough wood and cardboard in the box to look reasonable value. The same high quality tiles, the same great cartoon artwork; everything looks great. But is it smoke and mirrors? The only thing that needed to be here were the 12 new tiles and the six giant meeples. And oh, I keep forgetting to mention the ’tile tower’. Ye gods… Quite simply, it doesn’t work. I’ve had four separate people try and use it and all have given up in frustration. The tiles fit too snugly and won’t come out smoothly – which is a crying shame, as it looks beautiful. I’ve read some message boards on the subject and it seems very much luck of the draw – some of them work fine, others are unusable (like mine). So I’ll be using a drawstring bag, the quest tiles and occasionally the giant tiles/meeples – which again calls into question its overall value. And I’m afraid there isn’t a simple answer. I’ll be keeping the expansion, as I feel it adds to the original in several key ways. But would I be happy with what I’d spent if I’d had to buy it? I can only guess, but I think the answer would be ‘grudgingly’. … and does it fit in the original Kingdomino box? This is usually the simple bit! But there seem to be no easy answers with this expansion. The simple answer is no: the tile tower is bigger than the original Kingdomino box in length. However, if you throw it away (because, perhaps, you were unlucky enough to get a bloody useless one), things become a little more interesting. One of the nice things about the base game is that everything fits beautifully into the basic plastic insert provided. On the flip side, of course, it means you can’t use the original tile area to draw from as the giants tiles won’t fit in it. However, if you ditch the insert, and the cardboard tile tower, everything does fit into the original box – and you can even draw tiles from it, as they just fit in a single row (in the image, the other tiles are the end game scoring ones). Hurrah! 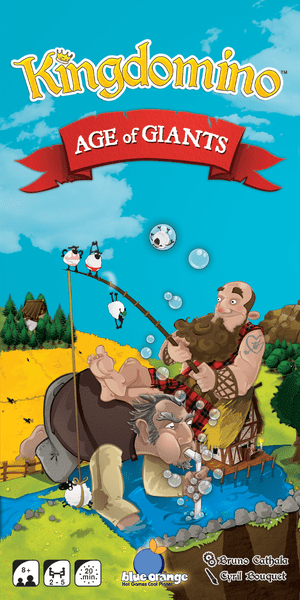 * Thank you to Coiledspring Games for providing Kingdomino: Age of Giants for review.